Tidal is streaming another concert live for anyone to watch, this time an impromptu show featuring rappers Lil Wayne, a part-owner in the service, and 2 Chainz. It’s not the first time Tidal, the subscription music streaming service owned by Jay-Z, has livestreamed a concert. It made a livestream available to the public at large of the service’s own splashy October gig at New York City’s Barclay’s Center, featuring performances from megastars Beyonce, Jay Z, Nicki Minaj, Lil Wayne (again), Usher and Nick Jonas — some of whom are also part-owners in Tidal. The company said tonights concert and stream adds to Tidal’s list of exclusive content, something it has been amping up differentiate itself from bigger subscription services. But rivals are taking the same approach. Apple Music has invested in video exclusives like a documentary movie about Taylor Swift‘s world tour and Drake‘s “Hotline Bling” music video, which debuted on Apple Music. 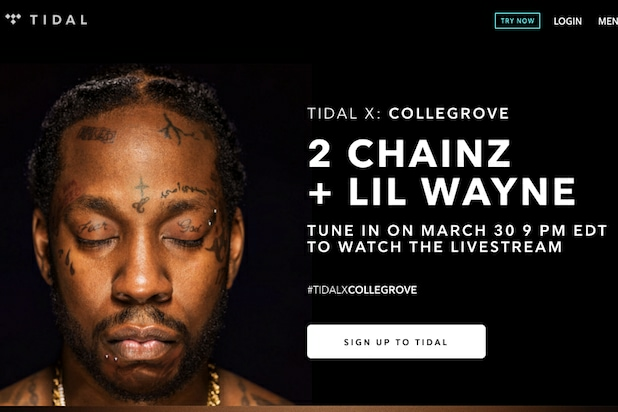 The Tidal X: Collegrove popup concert and livestream starts at 9 p.m. ET / 6 p.m. PT from The Tabernacle in Atlanta, Ga. The livestream will be available to anyone at tidal.com/collegrove. Tidal this week said it has surpassed 3 million subscribers. That puts it behind Spotify’s 30 million and Apple Music’s 11 million.